I loved doing my first LED cube prototype and I want to take it to the next step - towards a feature complete version. For this I will need a chip to hold the software and control two RGB LED's as well as the sensor that I'll be using for user input. I've looked at specialized PWM chips that can control the different channels of RGB LEDs but in the end it's both cheaper and easier to just use the chip that the Arduino platform is based on - the Atmel 328's. If you buy more of these, the price improves a lot. If you order enough, you'll actually get it near half the price of just a single one and this seems to be a rule of thumb for electronics in general. This is the difference between mass production and one-offs. If you sell enough of anything, you can make a lot more money. So what do you need to make your own Arduino then? Some time ago I picked up a MintDuino from MakerShed. 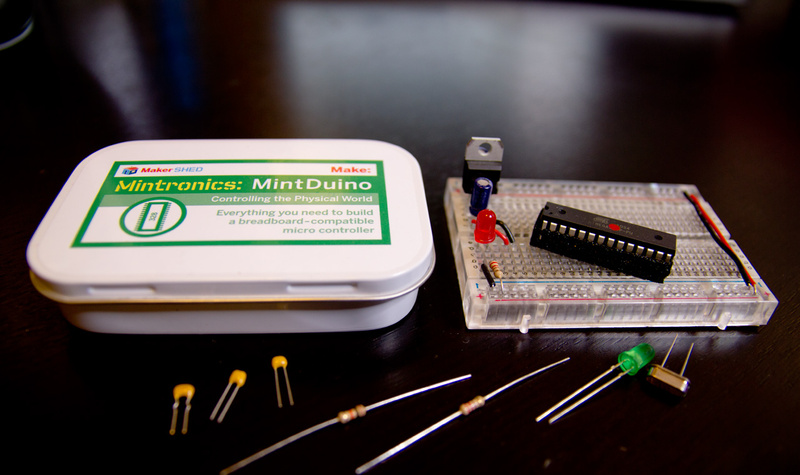 It's a fully working Arduino - delivered in an Altoids tin (pictured above). This version comes with a breadboard, but how much would it cost just to get just the electronic components used? The content of the MintDuino box is almost the same as this list on the Arduino site that tells what you need to build your own minimal version. * I've since learned that apart from the lower price the ATMEGA328P-PU uses less power, thus the extra P in it's name. These are about $2.5 extra a piece, but probably worth it given the lower power consumption. So - if you manage to sell 10k units, these will cost 57% of buying a single one. I dunno the price of the breadboard and the printed Altoids-tin, but it would seem that Makershed has a decent profit from this. It's still worth the money to their customers since they don't have to source the components and it's a great little project - in a tin. Keep in mind that the list above is just the MCU and the power regulator bits. You'll certainly need a few more bits to actually make something, but it's still facinating that you could build an almost complete microcontroller for just $3. I don't know for sure, but I think it's sort of a rule of thumb that with the added packaging and parts, most kitmakers should have at least a 100% profit on what they sell. In other words - if it seems to the end user that the parts are about the same price as they would have to pay themselves to make the same, they may just as well buy it from you. So to use the example above - $6 would appear to be cheap for $3 worth of components. You could probably make good money selling it for more such as the neat $13 Diavolino kit despite the fact that a fully soldered Arduino Duemilanove only costs $15. UPDATE: by August 2013, the prices in the table above have improved a lot, so the ATMEGA above would now be almost a dollar less for volumes above 100. In my case, I won't need the 5mm LED's and the tactile switch in the list above, but I'll need a few other parts. I'll need the tilt-switch to turn the cube on/off, two 10mm diffused RGB LEDs, coin cell battery holders and an input solution. I'm not sure if the vibration switch from Sparkfun will do the job, but I'm quite sure that I can solve it with some sort of touch-chip. These are fairly cheap, but they'll require more testing. Should be fun! They sure look pretty! Where can we get them?